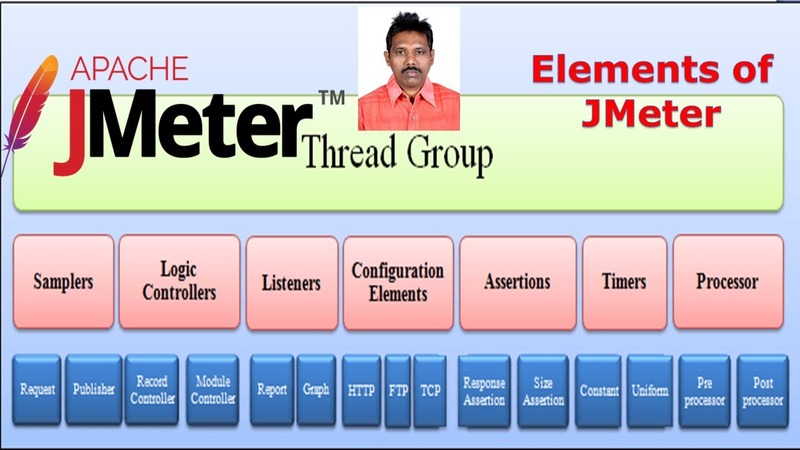 Elements of Apache JMeter, Test Plan, Thread Group, Controllers, Listeners, Timers, Assertions, Configuration Elements, Pre-Processor Elements, Post-Processor Elements and Execution order of Test Elements. Create JMeter Web Test Plan, JMeter Database Test Plan, JMS Test Plan, JMeter FTP Test Plan and JMeter Web Services Test Plan, and conduct Web Page Performance Testing, Database Server Performance Testing and Web Services Performance Testing. Conduct all types of Performance Testing like, Load Testing, Stress Testing, Spike Testing, Endurance Testing, Data Volume Testing using Apache JMeter Tool. > Different parts or components of JMeter are called JMeter Elements they co-relate with each other but designed for different-different purposes. > Before start working on Jmeter Tool , it is important to know all components or Elements of Jmeter with full detail description. > A test plan is the top level element of JMeter, explains sequence of steps execute at run time. A test plan made up of Thread Groups, Sampler, logic controller/s, listener/s, timer/s, assertions/, and configuration elements. Each Sampler can be preceded by one or more Pre-processor element, followed by Post-processor element, and/or Assertion element. > Test Plan saves in Java Management Extensions (JMX) format. > A Thread Group is a set of threads executing the same scenario. It is the base element for every JMeter test plan. > There are multiple thread groups available which can be configured to simulate how the users interact with the application, how the load is maintained and over what period of time. i) Number Of Threads: It represents the total number of virtual users performing the test script execution. ii Ramp-Up Period (in seconds): It tells JMeter how long to take to reach the full number of threads. For example, if you have 100 users with a ramp-up period of 50 seconds, JMeter will take 50 seconds to get all 100 threads running, adding 2 threads per second. iii) Loop Count: It is the number of executions for the script. For example, if the loop count is 2 and number of threads is 100 then the script will run 200 times. If the loop count is set “forever” then new threads will keep starting until the tests are stopped. iv) Delay Thread Creation Until Needed: If this option is checked, the ramp-up delay and startup delay are performed before the thread data is created. If not checked, all the data required for the threads is created before starting the execution of a test. v) Scheduler: This schedules the tests. You can set custom duration and startup delay to create the threads in this section. > JMeter has two types of Controllers: Samplers and Logical Controllers. These drive the processing of a test.Samplers tell JMeter to send requests to a server. > Samplers tell JMeter to send requests to a server and wait for a response. They are processed in the order they appear in the tree. Controllers can be used to modify the number of repetitions of a sampler. > Logic Controllers let you customize the logic that JMeter uses to decide when to send requests. Logic Controllers can change the order of requests coming from their child elements. They can modify the requests themselves, cause JMeter to repeat requests, etc. > The Test Fragment element is a special type of controller that exists on the Test Plan tree at the same level as the Thread Group element. It is distinguished from a Thread Group in that it is not executed unless it is referenced by either a Module Controller or an Include_Controller. > Listeners can be added anywhere in the test, including directly under the test plan. They will collect data only from elements at or below their level. > By default, a JMeter thread executes samplers in sequence without pausing. We recommend that you specify a delay by adding one of the available timers to your Thread Group. If you do not add a delay, JMeter could overwhelm your server by making too many requests in a very short amount of time. > Assertions are used to validate the sampler response received from the server. In order to test a sampler response, we add different assertions to the sampler. If an assertion fails, the sampler response is marked as failure and the same gets reflected in the test results. The XML assertion is used to validate that the response follows a valid XML syntax. > Configuration Elements in JMeter are used to configure or modify the sampler requests made to the server. These elements are added at the same or higher level of the samplers they want to configure. > A Pre-Processor executes some action prior to a Sampler Request being made. If a Pre-Processor is attached to a Sampler element, then it will execute just prior to that sampler element running. > A Pre-Processor is most often used to modify the settings of a Sample Request just before it runs, or to update variables that aren’t extracted from response text. > A Post-Processor executes some action after a Sampler Request has been made. If a Post-Processor is attached to a Sampler element, then it will execute just after that sampler element runs. > A Post-Processor is most often used to process the response data, often to extract values from it.